Morning all - so the best laid plans of me kinda fell apart last week, with just my regular painting post going live. I aim to rectify that this week, and we'll start today with a bit of a departure from the norm! I'm going to talk about magic. 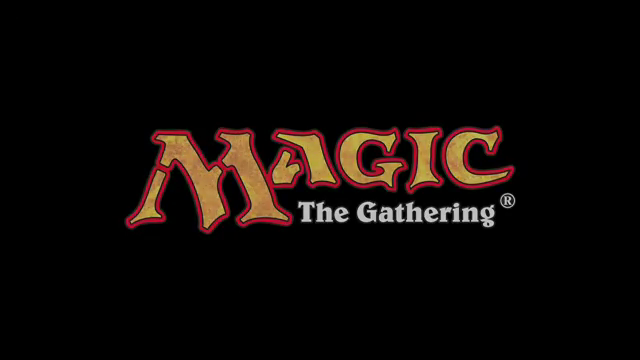 Not the pseudo magic of the 40k psychic phase, or even the actual magic of Warhammer fantasy (soon to be referred to fondly as Warhammer: Dodo), no here I'm talking about Magic:The Gathering. 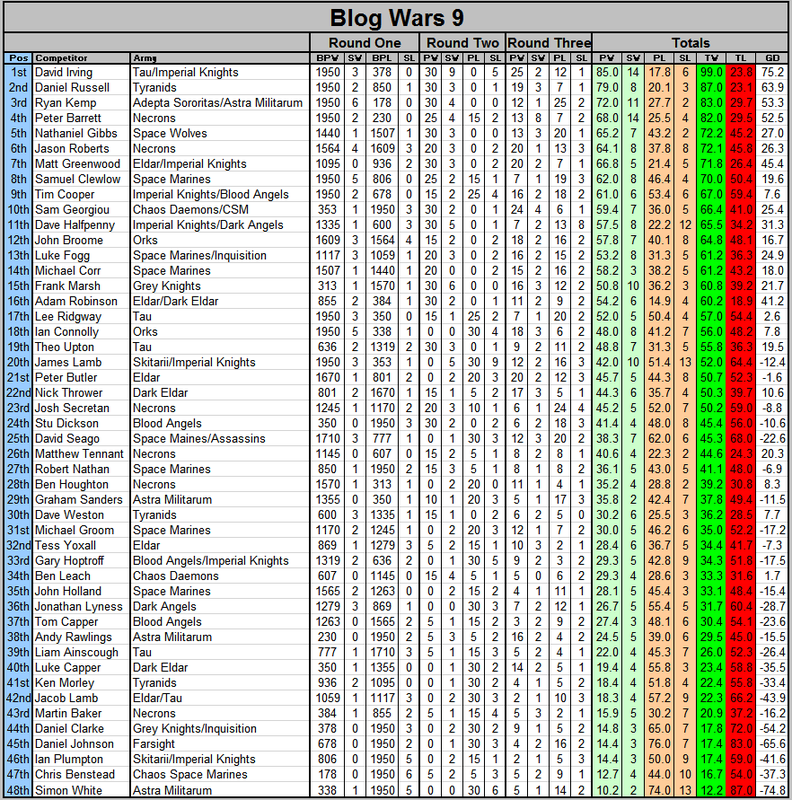 Some of you may remember that a couple of weeks ago I attended BlogWars 9, a great event run by Alex over at From the Fang. Well, there were four of us from my club who went along and stayed overnight opposite the tournament venue, and the other three are all avid players of the game. You can see where this is going can't you - the offer to teach me the game was made and I accepted. And got hooked. I've since played another 3 evenings worth and have just ordered my first deck(s). So what does that all mean for my blog? Well, quite simply I thought I'd post about how I went about building my deck without splurging a fortune on a mass buy of card packs! First, a 'very' brief introduction to Magic for those of you who may not be familiar. What that means in laymans terms is that each player has a deck of 60 cards, taking it in turn to draw from the deck and play onto the 'battlefield'. In order to play a card, you need to have enough power (mana) to cast it, so each deck contains a proportion of 'land' cards (such as swamps, mountains etc) that grant you mana. The cards come in a bewildering array of types and effects, but I'll keep it simple by saying that there are two ways to win - either by reducing your opponent's life to 0 (usually starts at 20) or preventing them from drawing another card (ie they've played their whole deck). Each card usually falls within one or more of five colours, red, white, black, blue and green, and you need the appropriate coloured land to power that spell. Decks can be either mono-coloured or multi coloured. The advantage of the first method clearly being that any land cards you draw will power your spells, but at the cost of mono-coloured decks having weaknesses. Each colour has a style of its own, so my first few games were about figuring out which colour to use to start with. Very bluntly, red is about dealing direct damage, blue is about trickery and stopping your opponent playing, green is about growth and creating very big creatures, white is about healing and gaining life, and black is about using death and disease to your advantage. To this point, I've only played with red or black decks, but I was pretty convinced early on that I liked the black style of play, so that would be my first focus (I'm sure I'll build up other decks in time). The next problem therefore was how to get started - I've never had any involvement in any kind of trading cards before (not even football stickers as a kid) so the concept was new to me and I'll admit I got highly confused by the fact that you couldn't just buy a pack of black cards and build a deck that way. I did find you could buy intro decks though - pre-built and with a particular strategy in mind, but usually two or three-coloured. Undeterred, I found a website online where it broke down which cards you got in these intro decks, and after a long session poring over the details, and two spreadsheets setting out which cards came in which pack and what their effects were, I settled on two intro packs plus a few ebay buys to build my first deck. Those two intro packs of course have non-black cards in them too, so I'll actually have two decks, one mono-black and one red/white, which will be pretty poor and difficult to win with, but hey, I can add to them over time. First Decision - how much land to include. Wisdom generally seems to be that depending on the casting cost of the cards in your hand, and if you've got more than one colour of cards, 19-26 land is a good place to start. I've got a mono coloured deck but with some reasonably costly cards so went with 24. That leaves me needing at least 36 other cards to fill the rest of the deck. THere are other reasons why I included quite a few land cards, but I'll explain that later. So what strategy do I use? Well, black specialises in the nasty stuff, and looking through the intro packs I noticed there were a few threads I could use. Cheap, small creatures with deathtouch. Deathtouch means that if I attack with a creature, no matter how big or powerful the opposition creatures are if they choose to defend then they will die, even if they kill mine in the process (the exception being if they strike first) so with four available from the two intro packs, in they went. The problem with these guys is they are all ground-based creatures, and can't defend against flying creatures, so i needed a way to protect against those. In came the 'archetype of finality' card, which means that all creatures I control have deathtouch. It's also a creature card in its own right so adds to my offensive/defensive abilities. It's quite expensive though and I can't rely on drawing it, so in came the 'aspect of Gorgon' card, which is cheaper to cast, and grants deathtouch to a single creature, also increasing its offensive and defensive abilities. That's plenty of that then, my opponents won't want to throw big and costly creatures into the fight for fear of them being killed outright by my cheap nasties. One of the things that came through in my learning games is that cards that have ongoing effects can be game-changing, particularly when they directly affect your opponent's life counter. First up was 'stab wound', a card that not only reduces an enemy creature's offensive and defensive stats, but also deducts 2 life from the life counter every turn. The only way to remove it is to either counter the spell when it's cast (not common) or kill/sacrifice the creature on which it is cast. Now of course it does have the drawback that if i attack then my opponent can use this creature to defend and potentially get killed, but for -2 life per turn, it's an alternative strategy that will put a time limit on my opponents actions. Second card in this category is an expensive one - 'caustic tar', which enchants one of my land cards. It means that by using the power the land generates, I can cause my opponent 3 life damage directly, and again I can use this every turn. Combined with the above card I doubt I'd need to attack at all, as 4 turns with them both in play would see my opponent dead. Next up was one of my favourite cards so far (unused, but it seems to be very good indeed), and that's 'Fate Unraveler'. This card causes my opponent(s) to lose 1 life every time they draw a card. Which is every turn basically. I then boosted this by including a couple of 'Grim Guardian' cards, who deduct 1 life from each opponent when they enter the battlefield, and also when another 'Enchantment Creature' (a type of card) is played. My deck has 8 such cards. Finally then for this element, 'Indulgent Tormentor' means that unless my opponent sacrifices a creature or pays 3 life, I can draw an extra card every turn. Granted, it won't force my opponent to lose life or sacrifice a creature, but it does either that, or grants me a better chance of getting cards into play. Along similar lines, 'Profane memento' is a cheap card to cast, and gives you a point of life every time an opponent's creature cards are put into their graveyard (killed or discarded essentially) This means that I'm not just cutting down my opponent's life, but gaining my own at the same time, and this card is as cheap to cast as they come. Some of the most powerful creatures out there are flying creatures, as they can only be defended against by other flying creatures or those with the 'reach' ability. Now green decks can make some very big creatures indeed, and bypassing those (or at least having the option to) is therefore a key element of being able to win. On that basis I wanted to include plenty of flying options. I started with a pair of 'carrion crows', which are comparitively inexpensive at the cost of not being able to defend on the turn they arrive. The 'indulgent tormentor' card I've already mentioned is also a flying creature, and I included a pair of 'gargoyle sentinels', which are defenders (can't attack) but can be made flying creatures by paying a power cost in your turn (see why I included a few extra land now?). Next up were a pair of cards that weren't in the intro packs that I've bought from ebay, 2 'Sengir Vampires'. These are pretty strong flying creatures at the best of times, but increase both their attack and defense by 1 point every time a creature they damage is killed. With a potential 7 flying creatures (with a total attack power of 23+ combined) that's probably enough. Something that black decks seem to specialise in, is bringing stuff back from the 'dead'. First up is a pair of 'Odunos River Trawlers'. When these are played, I can return another 'enchantment creature' (I mentioned I've got 8 of them) from my graveyard, and I can also then pay a power cost to sacrifice this card to repeat that ablility. Next up is the 'Gravedigger', who can bring a normal creature card back when he enters the battlefield. Finally then the 'font of return', which is an enchantment that can return up to 3 creatures from the graveyard for a power cost. These elements combined should give me a reasonable protection against an opponent killing off my best cards. A neat trick is to force your opponent to discard part of their hand or deck. Blue specialise in this, and one game I played I had to throw away fully half my deck in one go, which was somewhat frustrating I can tell you. There are three cards I've included with this effect therefore, and whilst it won't win me the game, it will force some awkward decisions. The 'Brain Maggot' lets me choose a non-land card from an opponent's hand and remove it from play until the brain maggot is itself destroyed. Then I included 2 'Thoughtrender Lamia's', which force my opponents to discard a card when they, or any other enchantment creature, enter play. I'm calling them this because although it's a 40k term, it seems to apply well to the type of card. They are cards that reduce your opponent's cards effectiveness by reducing their offensive/defensive stats. We start with the doomwake giant, which applies a 1 point reduction to both offensive and defensive stats of all my opponent's creatures until the end of my turn. This also applies in any turn during which I introduce another enchantment creature to the battlefield. A pair of Nyx Infusion cards each apply a 2 point reduction to creature cards, (or a 2 point increase to the stats of enchantment creatures). Festergloom applies a 1 point reduction to all non-black creatures until the end of the turn, and enchant creature applies a 2 point reduction to offense whilst preventing the creature from blocking defensively. Stab wound also applies a 2 point penalty to offense and defence of a single creature. For a cheap cost each, I've also included 4 'Doom blade' cards, which simply destroy any non-black creature. They're mainly a means of last resort, but are highly effective against an opponent who's spent power and time building up a strong creature, and are less blockable than the deathtouch creatures. The final card in the deck has no special rules whatsoever, but is just a tough defensive creature. 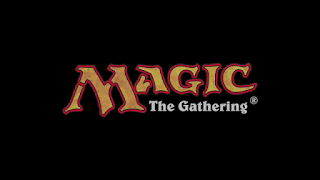 Hopefully the cards will arrive this week and I'll have a chance to feed back how the deck works in future posts, but in the meantime if any of you are experienced Magic players and can give me any advice on the above I'd be happy to hear what you have to say. Well last week was a wash out then in terms of me getting a painting progress article up! Painting progress - first three stealth suits are finished! Construction progress - the big beast has been collected, and is mostly built, albeit still in separate pieces for painting. Watch out for the riptide folks! Hobby update - Well that was a helluva codex drop - I managed to pick my copy up on Friday and am beavering away on a review to post up just as soon as I can, it may be in several parts though! Sales - I've put my Harlequin Solitaire (shown at the too) up on ebay, it's not going to get joined by any of the other harlequin releases so I figured why keep it in the cupboard gathering dust. It won second place in the harlequin painting competition on 'The Dark City' so it definitely worth a look if you're interested. So on to the meat of today's post - painting progress! I've been working away on a couple of projects recently, including the scouts you've seen before, and these guys, who you haven't! Here is the first half squad from my Tale of 7 Gamers collection - the Obsidian enclave. Now it's fair to say I'm really pleased with how these guys have come out (except i seem to have missed a mold line on the fusion blaster, grrr). The scheme is relatively simple to paint, which should keep time spent to a minimum - nice to do something uncomplicated after my Dark Eldar. I think it's still pretty striking though, and I'm loving the effect so far. Next up: 3 more, then a dozen fire warriors and a devilfish. 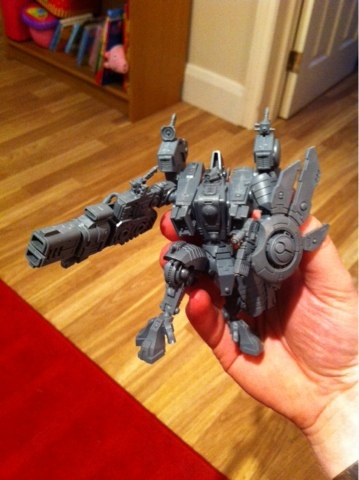 Because the stealth guys get lonely sometimes, I also decided to purchase the big daddy of the list, and have been having a blast putting him together over the weekend, here's my riptide so far, in hopefully a slightly more cinematic pose than the usual bland setup you get from using the pins in the kit. Hi all - time for another dose of Burning Eye medicine - this time of the blue-skinned variety! My club, MAD Wargames, has a bit of a history of running these campaigns using the format stolen from the original white dwarf fantasy tale series that ran years ago. This one is a little bigger than usual however, as seven players have signed up to take part. Unusually, we've also got a nice mix of armies taking part too, with the following factions represented. we're running the tale on a fairly slow timeline to start with, partly to see how we all get on with the games and the painting and partly to make sure we don't run out of money for new toys in between rounds. The first round therefore is set at 500pts, and our armies need to be painted up and ready by the end of August. During round one, we'll each play the other 6 players, with a win worth 3 pts, a draw worth 1pt and a loss 0pts. Completely painting your 500pts of models will net you a further 9pts making the round worth a total of 27pts. Painting more than 50% of the force gets you 5pts. In the first round, we've suspended the usual CAD requirement of 2 troops choices to allow a bit of variety into the lists, so only 1 troops unit is required. My first match is down for this evening, with either Martin or Mj stepping up as my opponent. I think it's a pretty balanced list, giving me lots of flexibility in deployment thanks to the infiltrating stealth suits. Each unit has a markerlight so I can adapt my shooting as necessary and darkstrider gives me a huge advantage against marines thanks to his structural analyser, which makes them effectively T3, and thus wounded by my pulse carbines on the roll of a 2+. He also makes it much harder to charge his squad as they can first fire overwatch and then fall back D6" before the charging unit is moved. I toyed with the idea of bringing less stealth suits and more fire warriors, but the potential for difficulty dealing with vehicles meant that I wanted the extra fusion blaster. To really give me a robust force, I added the EMP grenades, meaning that any walkers that feel like charging my squishy fire warriors will have to think carefully about the benefits before trying it. The final selection choices then were whether or not to give the devilfish the smart missile system for additional shooting, and what to equip my fire warriors with. I plumped for the gun drones on the devilfish for now, partly due to points (I'd have to either drop a fire warrior or their EMP grenades to afford the SMS) and partly due to having felt first hand the extreme irritation of guns that cause pinning checks. On two separate occasions in games before I've seen significant portions of my army pinned for several turns, completely ruining my strategy, and I felt I wanted in on that game. 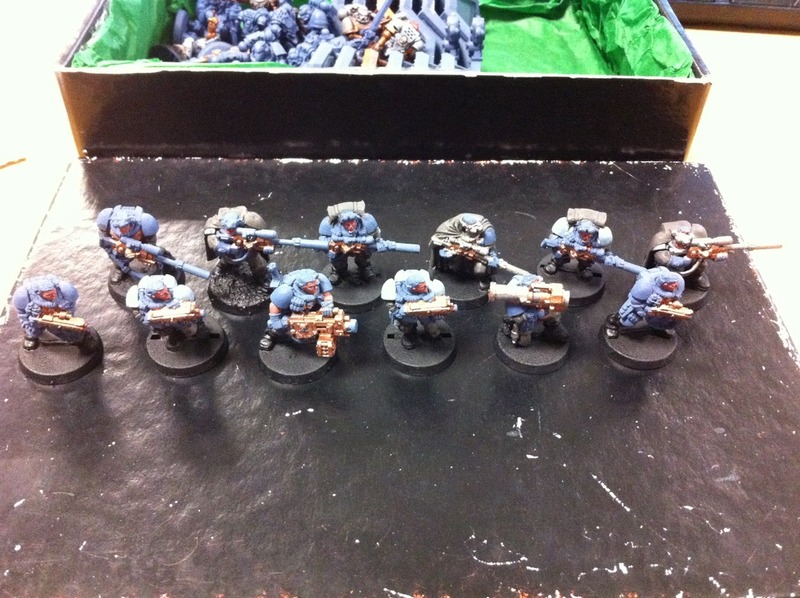 Consequently I've got 2 units that can potentially cause pinning, with the gun drones being an annoying distraction. I'll be doing my best to take proper notes during the Tale games with a view to building up a complete set of battle reports. If I get time I might even do a bit of fiction to go with them! I've also got a bonus for you! Tonight is also the first game in the new MAD League Bloodbowl season - this time with only 6 players, I'm hoping we'll have a much more slick, easy to run and finish season. I'm in with my beloved Skaven this time round, with the five other teams being Amazons, High Elves, Lizardmen, and two Chaos Dwarf teams. My first game is against the Amazons, who I suspect I'm going to have a tough time putting on the ground. If Martin's dice behave, this could be a difficult game, though with 150,000 gold pieces to spend on a skill kitty at the start of the season things shouldn't be quite so bad. Till next time, watch out for the bottomless pit of despair! Well, I attended my first tournament on Saturday, BlogWars9 run by Alex over at From the Fang, and a fantastically enjoyable day it was too - thanks to Alex for organising! 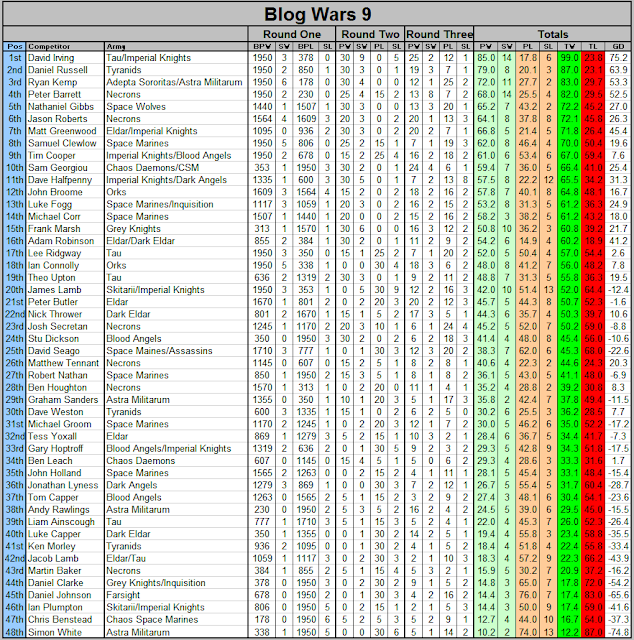 Now those loyal readers may recall that back in January I made a load of hobby resolutions for the coming year, and one of those was to place in the top half of the competitors at blogwars. Tick! I achieved that resolution this weekend, coming 22nd out of 48 players (with a comfortable margin of 5/99pts ahead of 25th place). I also managed to place 4th in the voting for best painted army, which I am taking as a very great compliment, since a lot of the armies there were seriously stunning - congrats to Dave Weston for his Tyranid army that won the prize, they're absolutely incredible and I can't wait to see what he's working on next! I played an army form the new Eldar codex (never faced new codex Eldar before), which included Karandras and some striking scorpions, warp spiders, two wave serpents with fire dragons and dire avengers, a wraithknight, hemlock, a couple of ranger units and a fire prism. The game awards unit cost points for destroyed units (and half points for half units) plus 100pts for killing the enemy special character, but I'm afraid to say it was a sound thrashing. I went into the game reasonably positive, but when my lances failed to scratch the wraithknight on turn 1 (there was a prize available for the first player to kill a superheavy/gargantuan) the writing was on the wall. Added to that, my Talos died to bladestorm overwatch, Karandras and his scorpions battered everything they faced and the wave serpents ruined my skimmers. Later turns saw me come back into it a bit when my razorwing arrived and wiped out a dire avenger squad but that was token resistance really, as you can see from the first game results above I lost by a mighty 1670-801. 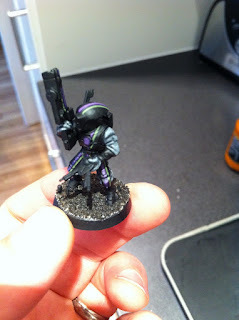 Another Eldar army, aargh! Very different this one, a farseer, three jetbike units with scatter lasers (urgh), squadron of falcons, two units of dark reapers, one of warp spiders, one swooping hawks, one fire dragons and maugan ra. Game was based around three objectives with scaling victory points depending on how far they are from your deployment zone (5pts within, 10pts middle and 15 in enemy dz). This one went right to the wire, the early turns went quite well as i silenced the falcons and stripped down most of the dark reapers (thank you razorwing once more) and some bikes, including farseer. Maugan Ra fell to a kamikaze drop by my Archon and heat lance scourges. Later turns things began to fall apart however, my deep striking warriors got hampered/killed meaning I couldn't claim my enemy's objective marker and vehicles started to drop. On the last turn, my opponent fired everything he had at Urien Rakarth (who'd gained back a wound thanks to It Will Not Die) taking out his grotesque bodyguard and bring the main man down to a single wound, but they failed their charge (twice) to push him off the objective (the mission grants him ObSec) thanks to them having to charge through terrain and into the face of a grav wave generator. I won 15-5. This was definitely the most tense game I've ever played, as every dice roll centred on Urien was making me twitch by the end. Finally, something I know about - I faced a mech guard list with Pask and two punisher companions, a wyvern, 6 chimeras filled with guardsmen and a pair of vendettas (awesomely modelled as airships! 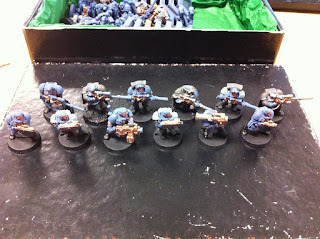 The guardsmen themselves were great too, using the old squad models). We played a modified maelstrom mission over a stunning looking scenery piece, a huge railway bridge spanning the entire 6x4 table. This was possibly the weirdest game of 40k I've played. The dice and objective deck began in my favour, giving me choice of sides (so I obviously chose the one with 3 objectives in easy reach!) and plenty of early achievable objectives (after 2 turns I was 9-1 ahead). Things got less successful from there as my haywire scourges failed to hit much, my archon was swamped by guardsmen after he lost his shadowfield save, and those tanks and flyers started to cause casualties to mount. The biggest problem was that all my AI firepower had been stranded on my own table edge by damage results, and all the enemy infantry was over the other side of the table. Probably my favourite game of the day however, a great opponent to play against, really good fun and played firmly within the spirit of the tournament. Added to all that fun, when the raffle was drawn, I even won a (second) copy of the new knights codex - which I've managed to sell on already at a price that covered the cost of my ticket in the first place. So to wrap things up then, I had a great fun day's gaming, met some really nice people, many of whom I've bumped into online in various places, and I'd thoroughly recommend it to anyone in the future. I'm yet to completely rule out attending the next one due to new arrival (I had ruled it out, though last night my wife did open the door to it just a little bit) but will definitely be in attendance at BW11! 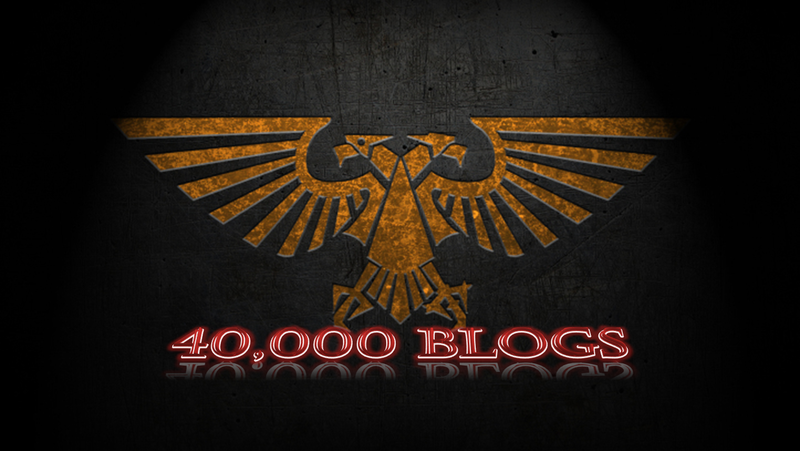 Thanks once again to Alex (and to Mj for driving), and just a quick note to say that one of the guys from my club who attended (Mj) has also now started a blog (Vulkan's Fireborn) so keep an eye out for that in the future! Painting progress will be updated in a couple of days so as to let this post get its time in the limelight (and obviously because having been away at the weekend, I've barely done any). Blog Wars 9 - wish me luck! So, the time has come (the walrus said) and I'm off to my first ever tournament - BlogWars 9. There are 4 of us going from my club and we're heading up to Stockport tonight to get ourselves ready for the event. New Space Marine codex - how will you deal with yours? Hi all - today I'm going to talk about that moment in our lives we all love and hate in equal measure - the day our codex gets replaced - the excitement of poring over the pages to see what's changed and what's stayed the same, have they nerfed your favourite unit or is that choice you've always wanted to use but never found a place for now what you always hoped it would be? 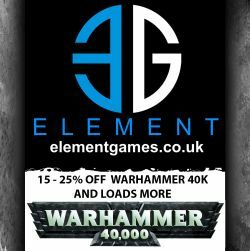 Not so much a game tactics post today then, more a collection tactics article, very much based around what to do when your army's codex is replaced, and how to evaluate the changes made. 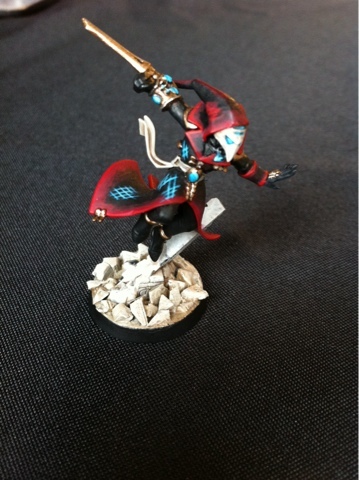 Iron Fists painting update 1/6/15, plus Necron vs Dark Eldar batrep! it's been a quiet painting week for me this week so little progress to report I'm afraid. As a result, I'm going to include a brief(ish) report on my game from Thursday night, where my DE Kabal teamed up with a small force of Coven units to push back an incursion by the foul Necrons on a planet they frequent for slave raids. But painting first and foremost - what have I managed this week? Well the storm raven is sitting on my painting station in exactly the same state as it was a week ago to my eternal shame - it's going to have to stay that way for a while now as my pledged painting pile for this month is quite large. I have managed some progress on the scouts, and they're coming along quite nicely though again they'll have to wait until I've finished some other stuff now. The main progress however has been setting out a scheme for the Obsidian Enclave units I've got stashed away, which is mainly a dark scheme (a real departure for me as I'm sure you'll agree given my previous Iron Fists and Burning Eye Kabal armies). I've retained a little bit of colour interest, but it's much more subtle than my other collections. 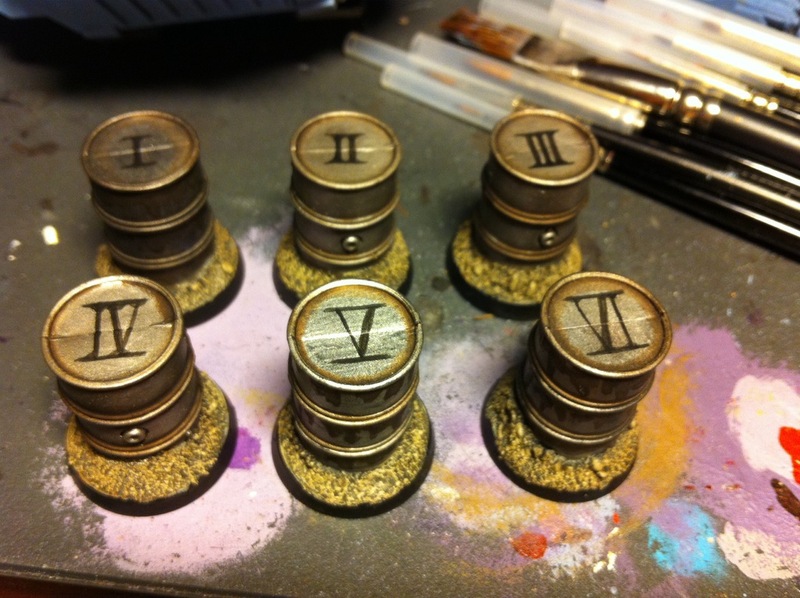 And finally, I've finished a few objective markers for maelstrom games (these are required for the BlogWars tournament I'm attending this weekend. They're a bit basic but I've got a few others planned that are more elaborate when I've got more time. So on to the game report then, how did I get on against the ancient enemy of the Eldar race? We played a maelstrom mission, number 2 from the rulebook, so we each started the game with a single card and drew 1 for each objective we held at the start of our turns. Now I'll have to apologise here because I wasn't taking notes on these games, so I've no idea what objectives were drawn when, and I'm relying on my memory for the breakdown of what happened. As such, the report won't run on a turn by turn basis, but will be a more fluid descriptive style. I definitely won the roll off for table halves and deployment, and I decided as the Necrons tend to be quite a short ranged army that I would deploy first. I placed the majority of my units on the table at this point, keeping back only my razorwing, my archon and his unit of scourges (including Urien Rakarth) and the Hellions. My opponent kept a substantial amount of units back in reserve, the obelisk formation with two monoliths, a big unit of warriors including two characters, a unit of immortals and his transcendent C'Tan. That gave me a big advantage on turn one, as I was facing a ghost ark, doomsday barge, two annihilation barges, a triarch stalker and a tomb spyder with a host of scarab bases. Cue me opening up on turn one with all of my anti tank firepower at the forces arrayed against me. The doomsday barge went down to a catastrophic explosion at the hands of a ravager, whilst other lances took out the ghost ark and stunned one of the annihilation barges. Thanks to the destruction wrought, return fire was sporadic, with the main impact being the scarabs charging a venom (which somehow survived). 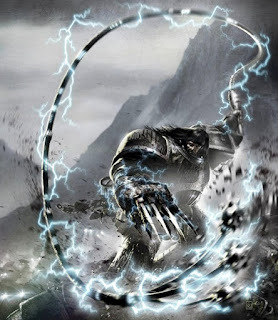 The Incubi made their presence felt in assault, wiping out the unit of warriors that had been inside the ghost ark, though they got flayed in return once the monoliths arrived on turn 2, discharging a big unit of warriors who levelled their weapons and wiped them out to a man. The reaver jetbikes responded to this atrocity, gunning their engines and breaking the second warrior unit including nemesor zahndrekh and imotekh the stormlord, riding them down as they fled. The Necrons then responded once again on my left flank, the monolith unleashing its particle whip and wiping out the surviving bikers. On my right flank, things went much better, the obelisk was stripped down to 2 hull points by lance fire, before it was destroyed by the arriving archon and heat lance scourges. the second monolith also took a severe amount of fire though it did manage to destroy one of my ravagers. The Tomb Spyder went down to splinter cannon fire, and the transcendent C'Tan fell to a similar hail of poison from the warrior gunboats. The Talos anchoring my flank weathered a huge amount of fire for the army, including much of the firepower from the annihilation barges, which could easily have damaged me much more had they been focused elsewhere, forcing me to be more aggressive with the Talos. The second monolith also slingshotted a unit of Immortals out onto my right flank, but a timely intervention by my unit of grotesques, accompanied by a Succubus and Haemonculus, soon put paid to any thoughts they may have had about turning my flank. When the dust settled at the end of turn 4, my opponent reviewed the field and decided to call it a day - he had remaining just the two monoliths and a pair of annihilation barges, whilst I was still able to call on 8 dark lances, a pair of blasters, two haywire blasters and 4 heat lances, not to mention the high strength attacks of the grotesques. At that point I was winning 8-3 in victory points. Overall then a satisfying win, though mitigated by a couple of factors. We gamers often cry about our bad luck with dice, bemoaning their randomness and implicating them in our failure. Well, this game I can't claim that - particularly on turn one the dice well and truly delivered for me - the ghost ark and doomsday barge were both destroyed with '6' results on the damage dice, and my opponent was thoroughly fed up with my Talos passing their Feel no Pain saves by the time he finally killed them - even the normal troops passed plenty of 5+ over the course of the game. Conversely, there was an astonishing lack of 6's on my opponent's dice, including one patch where he rolled over 50 dice without seeing a single maximum. The second thing for which I was most grateful was that he avoided using the decurion detachment. I'm not familiar enough with the Necron codex to understand the particular details of that detachment, but I've heard plenty about it and understand that by not using it, his troops were easier to get rid of. I think he prefers to use the obelisk formation, knowing that for many armies it's a major roadblock, but in this game the amount of AT firepower I could bring meant it was a manageable unit. Not sure what the subject of my next post will be, but look out for a report on BlogWars9 next week!